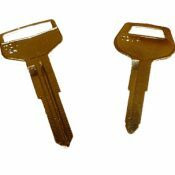 A key for any Daihatsu car manufactured between 1980 and 1995 cut to number or photo. Models Include: Taft, Pioneer, Fourtrak, Rocky, Mira, Cuore, Charmant, Charade, Applause, Feroza, SX, Sportrack. We do not use original Daihatsu blanks, we use high quality steel blanks manufactured by Silca.